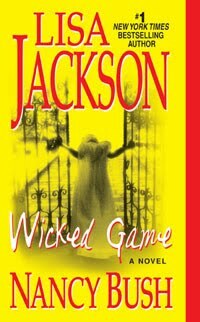 I'm currently reading Wicked Games by Lisa Jackson and Nancy Bush. I discovered Lisa Jackson a couple years ago and love her romantic suspense stories. I'm a series person. I love series that follow a group of characters and tells each character's story. I started with her New Orleans series and fell in like with her writing, the characters, the setting. The stories are intense and sometimes dark with spooky, creepy villains who chill you to the bone. Creepy good stories that will keep you up reading way past your bedtime. She not only writes romantic suspense stories, but historical romantic suspense, medievals and contemporary stories as well. Check out her booklist and discover for yourself. What is your most spookiest, chilling, goose bumpiest read? Hm, probably Minette Walters, who freaked me out enough that I haven't read her in years! I'm Brazilian and I loved your idea. I'm joining right now! My first book - actually, my first books, because I don't know what I will finish first- is the last of the Gossip Girl Serie and In The Drink, of Kate Christensen. Again, I loved the project!